Yalumba is well-known for its Menzies Wine Room and Vineyard, and when you visit this estate, you will see an extensive native vegetation area surrounding the property. It took approximately six years for Yalumba to revive and re-establish the remnant native trees, shrubs, and plants in this area. Yalumba is best known for its unique blends; one of which is the Cigar, a strong Cabernet Sauvignon with an elegant structure. Yalumba Coonawarra Estate’s Menzies is also a popular wine series; this 100% Cabernet Sauvignon Coonawarra blend has also received many awards and accolades. The winery has created this series from its own estate grown grapes from the Menzies Estate vineyards and similarly, the Cigar wine series also showcases unique Coonawarra blends and rich flavors. The Yalumba winery boasts a select and experienced group of winemakers, with all of these unique Coonawarra blends created just by them. 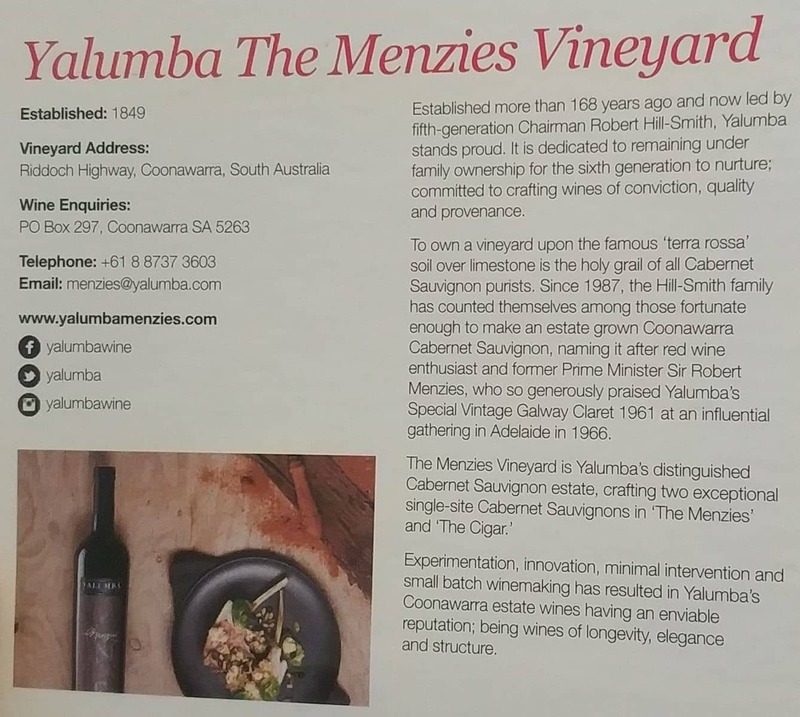 In 1987, Yalumba had its first inaugural vintage, the Menzies. Ever since, each of the series has made a name in the market. In fact, many wine critics also appreciate the unique wine blends of Yalumba. Yalumba does not have a cellar door, so wine purchases can be made online or through retailers. So if staying at the Menzies Retreat, you can relax in this quiet location all within a short stroll to many of Coonawarra’s wineries.